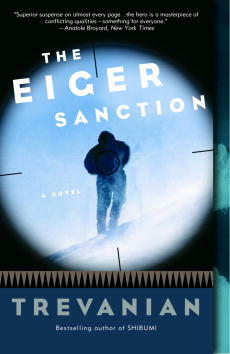 When it originally appeared in 1972, The Eiger Sanction created the then new publishing phenomenon of the world-wide best seller. Trevanian, (answering written questions from Judy Quinn of Publisher's Weekly, in 1998) said about it. In the event, (Trevanian) got the idea of writing a quick little spoof on the then-popular super-spy/action genre. (He did this having seen only two films within this genre and having read only a third of one of Ian Fleming's books — all he could manage before boredom weighted his eyelids.) He tossed the spoof manuscript over the transom of ten or so publishers whose names he had copied out of some sort of manual for would-be writers. He received total silence from about half these publishers, and rejections from the rest, save for two, one of which was Crown Publishers. They wanted to do the book. A reader from Colorado Springs, Colorado , July 16, 1998 The best spy/assassin novel I've ever read. I liked the main character, John Hemlock. He's an assassin for the government armed with a sharp tongue. He is a man without conscience but surprisingly Trevanian does a great job of getting you to like his character. I don't wish to spoil the entire book, so if anyone out there likes spy novels, this is the one for you. A reader , May 19, 1997 Highly Recommended. Trevanian has bestowed upon us a true enigma in Jonathan Hemlock. Art scholar, mountaineer, and world-class assasin, Hemlock is the most interesting fictional character I have read about in a long time. The dialogue is quick and witty and the story compelling. Alas, I was sad to have finished it. Spy novel lovers, put this at the top of your list.